Are little white lies really bad? Or, are they just a way for parents to keep their sanity sometimes? 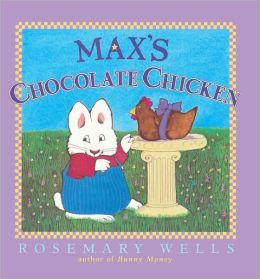 We checked out Max’s Chocolate Chicken by Rosemary Wells from the library last week. And of course J now wants a chocolate chicken. The egg hunt I could easily set up since I still have lots of plastic eggs in the holiday cupboard. But, have you ever tried to find a chocolate chicken in the middle of August? I would have settled for a mold and making it myself, but again, wrong season. Yes, it is a dove. You know that. I know that. J does not. He is happy because he has a chocolate chicken. And Mommy is happy because he is happy. And if anyone has a wedding or anniversary coming up and needs some chocolate molds, I have one with hearts and bells and doves. Otherwise I can break it out at Christmas and Valentine’s Day.